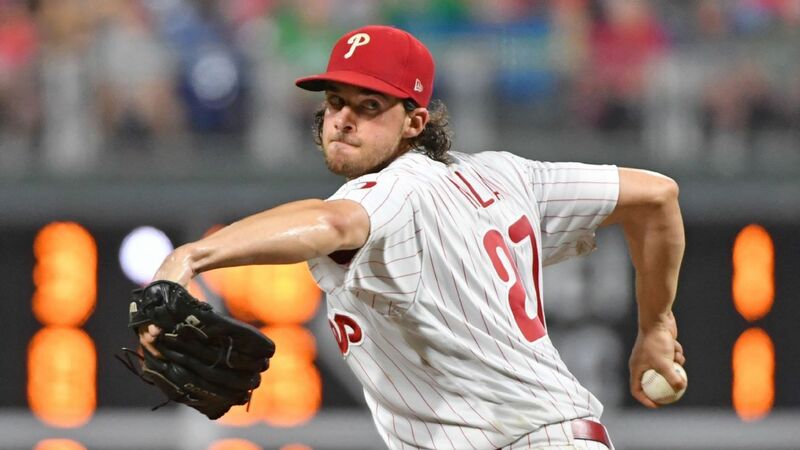 The Philadelphia Phillies and right-handed starting pitcher Aaron Nola are in agreement on a four-year, $45 million deal that includes a club option for a fifth season, league sources told ESPN on Wednesday. Nola, 25, was scheduled for an arbitration hearing this week. The deal, which includes a $16 million club option with a $4.25 million buyout, can cover what would have been his first two years in free agency. Nola is coming off a career-best season — 17-6 with 224 strikeouts and a 2.37 ERA in 33 starts. He finished third in NL Cy Young voting behind winner Jacob deGrom of the Mets and Max Scherzer of the Nationals. Nola will receive a $2 million signing bonus and make $4 million in 2019, $8 million in 2020, $11.75 million in 2021 and $15 million in 2022. He earned $573,000 last season. During arbitration exchange, the Phillies had offered Nola $4.4 million for this season and he was seeking $5.25 million.